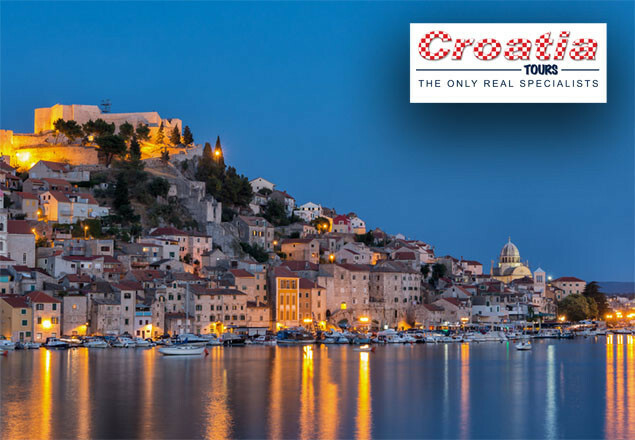 2 people - 1 week luxury 2-centre trip to Croatia with Croatia Tours inc. flights, transfers & 4* accom. Croatia Tours, the Only Real Specialists, have lovingly and carefully put together this exclusive itinerary for The Rewarding Times, offering a once in a life time experience and incredible value on a one week Luxury Two-Centre trip to Croatia. Experience the wonders of Croatia, as you discover the Roman-influenced city of Šibenik and the sunny island of Hvar including a day trip to the Waterfalls of Krka River National Park (with optional tours to Split, Plitvice Lakes and Blue Cave on the Island of Bisevo). Price includes return flights to Split, luxury four star accommodation, one excursion, all transfers by road and sea, and professional local support throughout. Spend the first 4 nights away from the crowded streets of Croatia’s usual tourist haunts in the fashion-conscious city of Šibenik. There you will stay at the fabulous 4*+ Solaris Hotel Jure. The highlight of your stay in Sibenik will be the visit to the Waterfalls of Krka National Park, a designated UNESCO Natural World Heritage Site. Transfer by coach and catamaran to the sunniest Croatian island - the Island of Hvar and stay in the 4* Hotel Amfora for another 3 nights. The Island of Hvar is the place to see and be seen and is the island most frequented by celebs, Eva Longoria, Kevin Spacey, Beyonce, Demi Moore and Gwyneth Paltrow, all spotted eating out in Hvar. 27th September 2017 Flight from Dublin to Split and transfer of approximately 1:15 hr from the airport to Sibenik located in picturesque and spacious bay on the sunken estuary of Krka River. Stay at the modern and sophisticated 4*+ Solaris Hotel Jure (park view room, Bed & Breakfast), set in wooded gardens next to a lovely beach and 6km from the Renaissance Sibenik Town. On the following morning, enjoy breakfast at your hotel before setting off for a sightseeing tour of an amazing National Park Krka River. We explore the park's extensive waterways and complex history dating back to late 10th century and first Croatian kings. The striking cascade waterfalls are magnificent, the only way to describe it is to see them with your own eyes. Transfer by boat and coach from Hvar to Split Airport for your home bound flight. Price is based on 2 people sharing a park view room on BB basis in the 4*+ Solaris Hotel Jure & a superior room with balcony on B&B in the 4* Hotel Amfora. Other room types are available upon request and at a supplement. Return Flights Dublin – Split. Day excursion to Waterfalls of Krka National Park. Purchaser of this offer should call immediately to book with Croatia Tours on 01 8780800 or email: info@croatia.ie as seats are limited, with your name and voucher code. Deadline for booking is Friday 21st of July at 5:30pm.